Discovered in 1972 by students from the University of London Speleological Society, Uamh An Ard Achadh (Cave of the High Field or High Pasture Cave) lies approximately 1km south east of Torrin in a shallow valley on the north side of Beinn an Dubhaich (Grid Reference NGR NG 594 197). 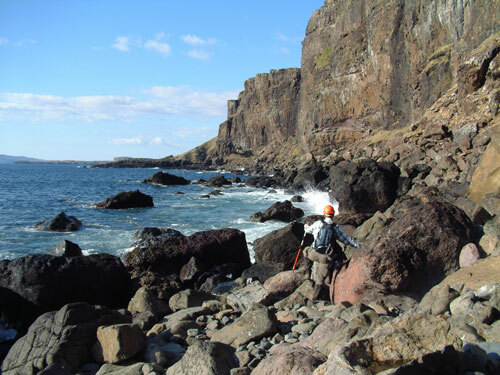 The cave contains around 320m of accessible passages making it the second longest cave complex on Skye. The cave passages are formed in the Cambrian Durness Limestone that outcrops in the Parish of Strath, while volcanic activity from the nearby Central Red Cuillin Complex has guided the morphology of the cave. The High Pasture Cave & Environs Project was initiated in 2003, after disturbed archaeological deposits relating to the use of the site during the Late Bronze Age and Iron Age periods were found in a high-level fossil passage of the cave. 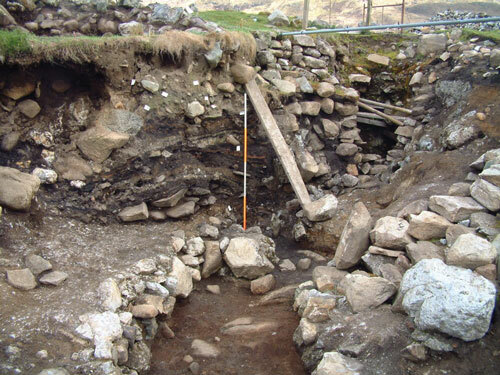 Funding from a number of agencies and offers of work in-kind from university departments and freelance specialists has permitted archaeological survey and evaluation work to continue at the site, which is located in the south of the island of Skye, in the Parish of Strath. Fieldwork completed to date includes geophysical survey and excavation, while post-excavation analysis is looking at a wide range of materials and artefacts recovered from the site. Survey work on the surface above the cave passage has revealed a range of stone-built structures of prehistoric and historic age. Evaluation of the wider landscape has revealed other archaeological features relating to prehistoric and historic settlement in this part of Skye, indicating the use of the land over a significant period of time. Local archaeologists Steven Birch and Martin Wildgoose are co-directing the project work, which has also been assisted by volunteers from the local community and archaeology students from Mainland and overseas universities. From our preliminary investigations at High Pastures it would seem that the function of the site has changed through time and while it is possible that the cave may have been used as a natural feature in which to deposit domestic rubbish, it is also becoming increasingly obvious that people entered this dark and strange world for other reasons. Work at the site over the past two years has revealed a stone-built passage descending, via a steep flight of steps, from the surface to the natural limestone cave below. 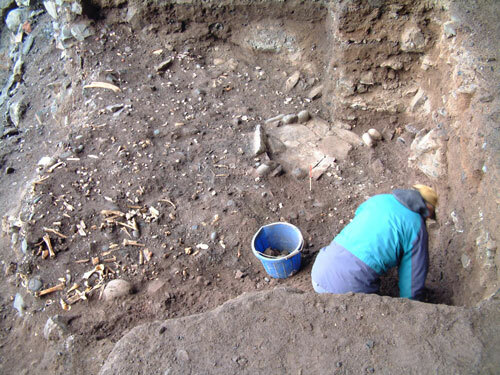 In 2005, the remains of three humans were found in the blocked stairwell, burials dating to the Iron Age around 2000 years ago, while a wide range of artefacts of stone, bone and antler were recovered from other areas of excavation at the site. Residues relating to metalworking have also been found, while a large assemblage of well preserved animal and fish bone provides evidence of the types of food that were being consumed at High Pastures during the prehistoric period. Analysis of the animal bone suggests that unusual butchery practices were performed on some of the animals, especially on cattle and pig, indicating that feasting may have been taking place at the site on some occasions. These factors, combined with some of the deposits of fine quality artefacts, evidence for metalworking and the deposition of human remains in the blocked entrance to the cave, illustrate the importance of the site in the wider Iron Age landscape of Skye and its possible use in a ritual function. The entrance to the cave may have provided access to the ‘Underworld’ or ‘Otherworld’, a liminal place in the landscape where people from the surrounding settlements held special feasts, made offerings to Celtic deities and undertook the manufacture of metals. What we may be witnessing at the High Pasture Cave site are elements of domestic life deployed in a specialised context, providing them with new emphasis. Fieldwork at the High Pasture Cave site will commence on Monday May 10th 2010 and will continue until early September 2010. There will be a two week break from excavations at the site between the 21st June and 4th July 2010. This will be the last fieldwork season at the site. The rock shelter and midden, known as Uamh an Eich Bhric, lies below the west-facing sea cliffs of Skye, around 3km southwest of the village of Fiskavaig and some 400 metres south of Geodh’ an Eich Bhric and was discovered in the summer of 2006 by Rod Richards from Strathpeffer. The cliffs at this point are 110 metres high and are composed of layers of basalt laid down over several successive volcanic events during the Tertiary Period around 60 million years ago. Access to the site by land is difficult, requiring a walk of around 90 minutes across wet, undulating moorland, followed by the steep descent of a 100 metres high grass and heather slope to the shore below. A scramble over boulder talus deposits for around 500 metres along the base of the cliffs then leads you to the rock shelter. Access by sea is only possible in calm conditions and a mid to low tide, due to the hazardous landing on a rock-strewn boulder and pebble beach. Standing within the rock shelter you are overwhelmed by the sheer scale and grandeur of the place. 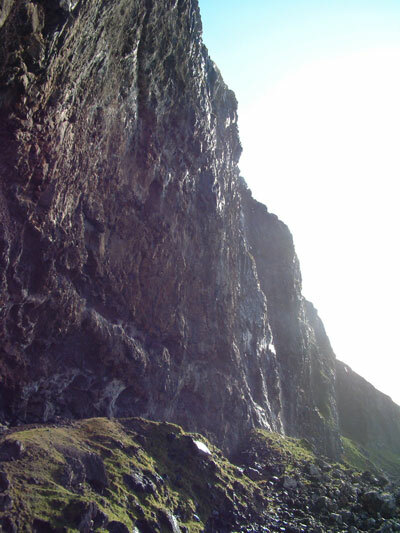 The roof of the shelter arches out above, containing bands of rock of varying colours while large waterfalls cascade over the cliffs to each side, the droplets of water and mist creating vivid rainbows as the sun gradually makes its way around the cliffs to the south casting its light into the shelter. The views out of the rock shelter through the southwest, west and northwest, are extensive - taking in the curving archipeligo of the Western Isles from Barra in the south to the hills of South Harris; while nearer at hand is the Duirinish Peninsula of Skye including MacLead’s Tables amd MacLeod’s Maidens. The archaeological deposits at the site are threatened by coastal erosion and wind deflation, and significant amounts of material have already been lost to the sea. It appears that the huge rock talus that protected the site to the seaward side was partially breached during the winter storms of 2005. The resulting wave action exposed the archaeological deposits within the rock shelter and a continual erosion process exposes new material on a regular basis. Work on site since the autumn of 2006 has included monitoring of these erosion rates, recording of the rock shelter and the eroding archaeological sections and the collection of material before it is lost to the sea. In 2008, we were granted funding from Historic Scotland to undertake emergency evaluation and excavation work at the site, and in the spring of 2008 we opened our first trench - Trench 1. This was followed later in the year by Trench 2, while further excavations are planned for the 2009 fieldwork season. The excavations have uncovered a wide range of features at the site including multiple hearth settings, pits, post and stake-holes - the latter providing evidence for ephemeral structures within the confines of the rock shelter. The dry, almost arid conditions within the rock shelter, have produced excellent conditions for the preservation of archaeological deposits. In particular, we have recovered a significant assemblage of animal bone, along with some fish bone and shellfish, while other organic deposits include possible bedding or floor materials such as bracken, and well-preserved tree bark (birch or alder) that has been peeled of the trunks of trees. The animal bone assemblage, like that recovered from the High Pasture Cave site, is interesting. The main species represented is prime cattle, while sheep\goat, pig and red deer are also present. Other wild species include wolf, represented by a mandible fragment. Evidence for butchery on the cattle is present, but does not conform to more usual butchery practices. A wide range of small finds have also been recovered from the two trenches excavated so far including bone and antler items, stone tools, ceramics, iron concretions, bronze objects and half of an amber bead. Metalworking residues have also been identified including slag deposits (iron and bronze), crucible fragments, a fragment from a clay mould and a small bronze ingot. It is remarkable to think that metalworking was taking place in such a remote site in the landscape. 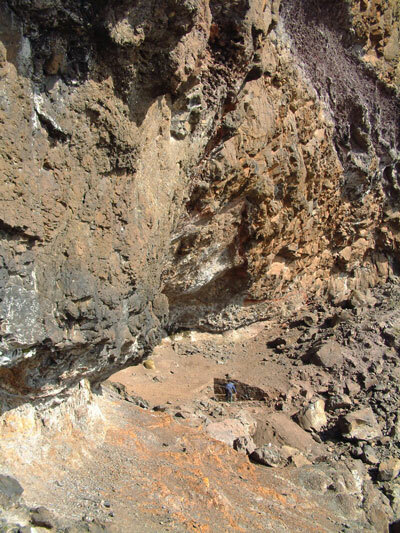 Two radiocarbon dates have so far been produced on samples recovered from the rock shelter. The date on a sample recovered from the base of the midden came out at 1905+/-35BP, while a sample from the top of the midden gave a date of 1870+/-35BP (we are most grateful for the generosity of Mrs. Suddaby and Ian Suddaby of CFA Archaeology in Edinburgh for the funding for these dates). These dates suggest that the site had a relatively short duration of use during the Middle Iron Age; the main activities starting here as the site at High Pasture Cave was closing down. Samples have just been submitted for eight additional radiocarbon dates for the Fiskavaig site, which are being funded by Historic Scotland. The excavations at High Pasture Cave and the Fiskavaig rock shelter are allowing us to investigate in some detail a new and exciting type of prehistoric site in the landscape. 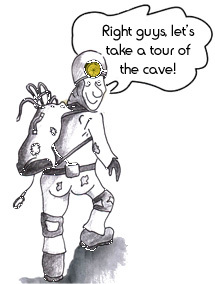 If you have enjoyed what you've seen here you'll also want to visit Ogof Ffynnon Ddu, a huge cave in South Wales.